I woke up today and wanted to fast-forward to tomorrow. Except that tomorrow is a full travel day with two (short) flights, a three hour bus ride, and a forty minute taxi ride to our destination, Barichara. Our friends Scott and Sonia own a house there so the four of us will enjoy a quiet week together. They've hosted other teachers before and Sonia made a comment about how interesting it is to see how other people relax. I'll bet. Here's how I plan to relax this week: run, read, write. That's it. Sonia and I will probably play chef in the kitchen. We'll explore the town, walk in the countryside. Play cards? Swim. Enjoy siestas. I might take my knitting needles and ball of yarn. 1. Me, knitting? 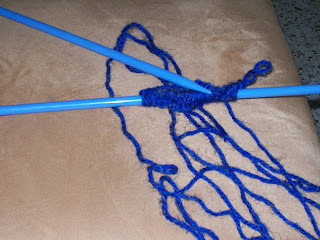 Last Sunday, Jen taught a few of the Bolivar ladies how to knit and at least one, Nira, also learned how to purl. 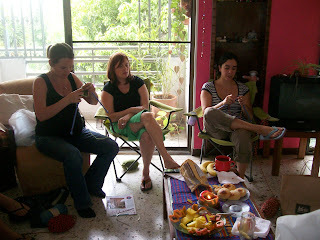 That's Jen, our maestra and knitting queen, Shannon, and Laura Elena who kindly hosted the group. I thought I'd better take a picture of my last "do-over." I had a good chunk going for awhile but kept dropping stitches and even though knitting is supposed to be relaxing, my shoulders were up to my ears. 2. Running is going well. I've been getting up insanely early to run without distraction, before the rest of the world (my small world) wakes. I am getting up at four in the morning and on the treadmill by four-thirty, showered and feeding Claire by six. That just sounds nuts. But I'm enjoying it. Which also sounds nuts. And while we're talking about things that sound nuts, I read while I run. I choose my books by font size. 3. Books. I just started Tales from the Town of Widows by James Canon, a Colombian author currently living in New York after studying at Columbia. (Love it). The book is wonderful and I'm only 57 pages into it. It's about a town whose men are forced to join the guerrillas and how the women left behind reclaim their town. Tales from the Town of Widows has been passed around among the import teachers and I can't wait to talk with those who've read it once I'm done. 4. Minor surgery. Not me, Justin. He's fine. But that consumed a chunk of our week and caused some worry. They knocked him out for a procedure that took maybe ten minutes. The doctor kept describing the pain Justin would experience and, well, it just hasn't happened. Maybe hour three on the bus tomorrow? Here in Colombia, trucks drive around dinging bells to tell everyone: come and buy this, come and buy that. We have a natural gas truck that drives down our street a couple mornings a week, dinging. Justin asked his anesthesiologist if he could get some sleepy gas from the gas truck. He was a bit out of it. 5. We're off for a family walk. Need sunscreen and soy milk and M&Ms. Need, yes. Enjoy your weekend! P.S. Claire has a tooth! I love getting up at 4 and having the world to myself to do my training as well. It's weird but I like it. I'm generally a night owl, but morning workouts are one of my favorite things in the world (once I'm up and going, of course). I'm going to have to check out the large print section at the library. I don't know why it hadn't occurred to me to read while on the bike trainer. And keep up the knitting! My shoulders were tense at first too, but it doesn't take long to get into a groove. When I first saw the picture of the knitting needles I thought it was static or something that comes in a globe, or science museum thing!